The purposes of this CD are to capture the efforts to teach this language and the Siraya songs. Moreover, it is hoped that it will raise awareness of the beautiful Siraya people and their language. In Taiwan, 400 years ago, when the Dutch occupied this island, the indigenous Siraya language was widely spoken on the western plains, especially around the area of present-day Tainan. The Dutch set up schools, teaching the Siraya their language in a Romanized form, as there was no written text. Today, there is a struggle to reclaim the Siraya language, after having rarely been spoken for two centuries, and this Romanization of the language has been invaluable in the development of a dictionary, now used for teaching. Only if the Siraya can relearn their language can they become officially recognized as one of Taiwan’s indigenous tribes. This CD contains 12 songs in the Siraya language, English and Hokkien (Taiwanese dialect, originally from southern China). Moreover, there are historic illustrations of the Siraya people provided by the National Museum of Taiwan History. 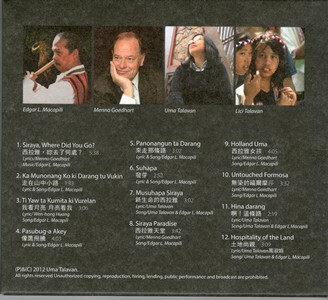 The three English songs were written by Menno Goedhart, former representative of the Netherlands to Taiwan. Edgar Macapili is an accomplished musician and composer from the Philippines. He is married to Uma Talavan, a member of the Siraya tribe working to promote the revival of her culture. Together, with Uma and her family, Edgar seeks ways to recall the Siraya language through teaching and music. Menno Goedhart is from the Netherlands. He spent a decade in Taiwan, much of that time as head of the Netherlands Trade and Investment Office in Taipei.